Spring is here, at least according to the date it is! I’m still waiting for the weather to reflect it. One indication that it is spring is all the beautiful asparagus you can find in the grocery store so I thought I would share this asparagus recipe with you. It has been a go-to recipe in my family for years! It pairs well with fish, poultry or pork; and since Easter is coming soon, what better side dish to serve with your ham? I recently was reading online at Eating Well about the 5 health benefits of asparagus. 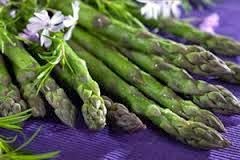 One more benefit of asparagus: It contains high levels of the amino acid asparagine, which serves as a natural diuretic, and increased urination not only releases fluid but helps rid the body of excess salts. This is especially beneficial for people who suffer from edema (an accumulation of fluids in the body's tissues) and those who have high blood pressure or other heart-related diseases. Not only is asparagus great for you, it’s also delicious so try out this recipe and let me know what you think! To make the marinade, combine vinegar, lemon juice, Dijon mustard, and garlic. Gradually whisk in the olive oil. Then season, to taste, with salt and pepper. If you can’t whisk, you can put everything in a jar and shake to combine. Then add in your diced tomatoes. I use a serrated knife in my Universal Quad Cuff to cut the tomatoes. Let mixture mellow at room temperature for 30 minutes. Next microwave asparagus (2-4 minutes until crisp tender) and drain. You can also parboil the asparagus if you don’t like using a microwave. Pour vinaigrette over asparagus then sprinkle with parmesan cheese. Let the asparagus marinate for 10 minutes before serving. This can be served at room temperature or chilled. Enjoy!